We just can’t continue to sit around helplessly waiting for politicians to “repair” the United States economy. We need to change the way we think and the way we shop. We work far to hard for our money and we need to stop handing it all over to foreign countries in return for cheap, low quality products and materials. If you really want to help, you need to start supporting US based businesses. Rather than buying that cheap foreign import, why not spend an extra dollar on the American made alternative! You’ll not only receive a higher quality product, but you’ll also help the US economy by keeping your hard earned money right here in the USA. I know it’s time consuming and may even cost more, but it’s worth it. It’s really enlightening to see that there are still companies out there like Jacob Bromwell that are fighting the very evil that is destroying this great country. 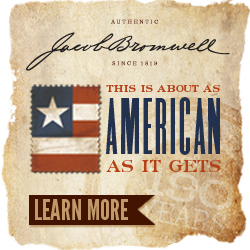 I highly commend Jacob Bromwell for staying true to their products and not selling out to the lower cost of foreign labor. I can only hope that Jacob Bromwell can inspire other companies to rethink their own business ethics. Abandoning foreign labor and materials in return for US based labor and materials may be the only way this country ever gets back on its feet. Are you ready to go that extra mile and buy American made products? Do you have a favorite American made product that you’d like to share with the rest of us? Leave us a comment and let’s get the word out! This entry was posted in Made in USA and tagged Made in the USA by Todd Bryan. Bookmark the permalink. Thanks for the comment and the suggestion, I really appreciate it. http://cutbrooklyn.com looks very interesting and I’ve already emailed them for some more info. Who knows, maybe you’ll see a blog about them here soon.